Employees can now join their friends when they use the online learning library. They can learn by watching what others do with The Quad, our intuitive social learning technology. It is a social community inside our Thinkzoom (LMS) campus created to encourage learners to connect with other learners. They can create their own informal network of peers beyond their formal, assigned learning groups. Social learning technology, like The Quad, leverages workplace friendships and connections to enhance the learning experience in an entertaining environment. The benefit is beyond social technology and learning engagement. Learners may actually have fun while they learn! How often do you watch the same video your friends have because you saw it in social media? This is the same idea! Learners can connect with other learners in a virtual space for collaborative learning. They can learn by observing what courses others are taking and reading their comments on courses of interest. Employees trigger social learning by the activity of their new network: courses viewed, exams taken, and comments posted. They can be motivated by the actions of their peers. 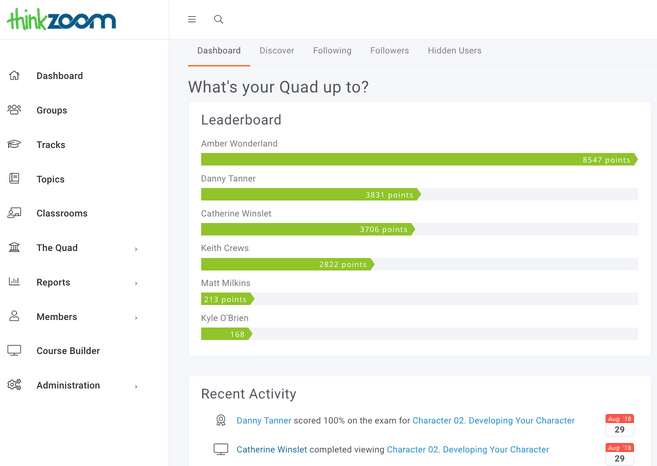 Learners can initiate friendly competition with lifetime leaderboards, knowledge sharing, and training reinforcement quizzes. When they view a colleague’s profile, the lifetime points meter at the top of the page may spark additional course viewing to match pace! Employees can recommend courses and interact with their peers of choice in their informal groups. Employees learn new skills and expand interests as course selection becomes self-directed. After a visit to The Quad, a team member who aspires to become a team leader explores videos on leadership they saw in their manager’s activity feed. An administrative assistant strives to provide stronger support during budgeting and completes an intermediate course in Excel. A buyer saves the company money after watching a video on negotiation. ej4 is dedicated to offering our clients new, cutting-edge features and improved value in our Thinkzoom LMS as part of their license agreements. The new functionality in the Quad provides the foundation for future innovation to provide learners with personal recommendations for new courses. Sign up for a free trial and you will have full access to our learning management system, Thinkzoom! No credit card is required. Just name your campus and you are in! As the admin of your campus, you can create groups, assign courses, watch videos, view reports and much more! You can add up to nine additional users so all of you can watch courses, share and comment and then visit The Quad to see the benefits of social learning. Your users will also receive additional training support through our training reinforcement tool, 4tify your Learning™, a series of quizzes over the following days.